Each month Heather thinks up a theme for us to stitch to, or in my case, a theme to somehow shoe-horn my existing stitching into, no matter how tenuous the link! This theme was a piece of cake! Absolutely no shoe-horning required this month. I used a vintage cotton thread to sew up the little ornie. I understand those wooden reels are quite sought after now. Next animals are the Dragon and the Goose, not a lesser-known Fairy Tale but the sixth in the Dragon Dreams 12 Dragonlets of Christmas series. 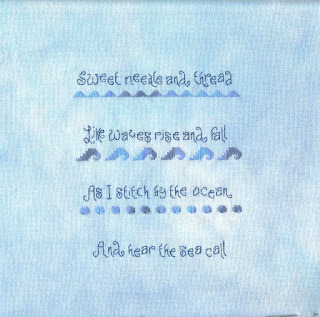 The third living creature is the fishies on my Hear the Sea Call sampler. I sourced some little mother-of-pearl fishes from an Ebay shop, the shells came from some old trim in the craft box and the abalone type stones came from the local craft shop. I framed it in a simple raw wood box frame. I decided to use this for my FB profile photo and to my surprise I got a comment from the designer Sue Donnelly of the Stitcher's Hideaway. She was very interested to see my finish and told me she is putting the kit together very soon so you can all buy it for yourselves. She also showed us a lovely Autumn design on orange fabric which would make a great companion piece. 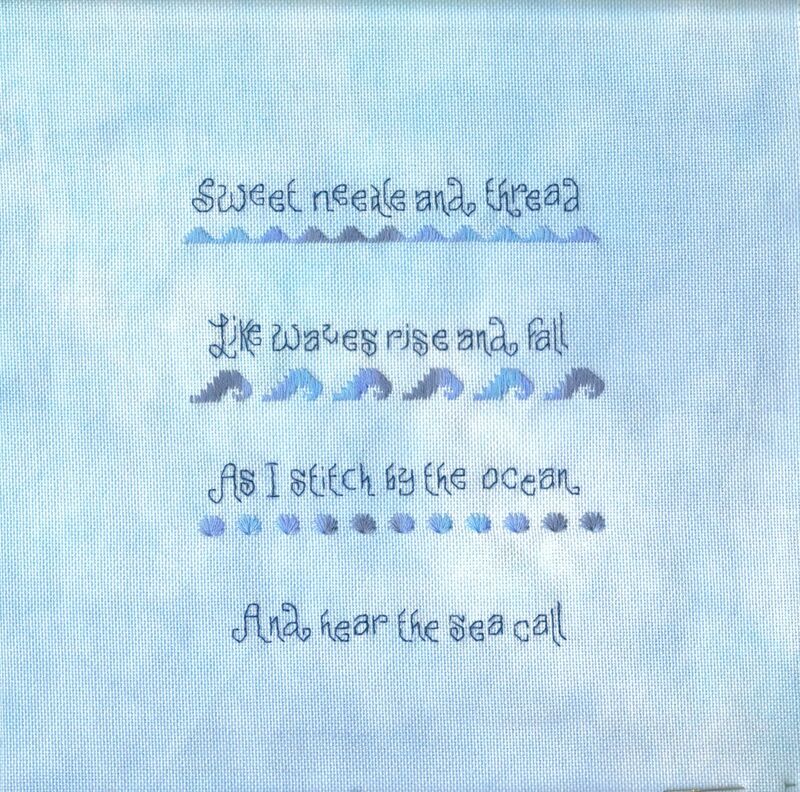 In the evenings I've also been stitching a type of fish, a mermaid is a half-fish isn't she? There was a very interesting chat on FB about mermaids and how they have little mer-babies. Obviously they can breastfeed so presumably they have live young rather than lay fisheggs!! Maybe they find them under sea-cabbages. Nora Corbett also told us she's had complaints in some States of America about the lack of clothing on her mermaids. whatever next! Anyway, my mermaid is Shimmering Mermaid for Karen's Round Robin. She is beautiful with her lovely free-flowing hair. 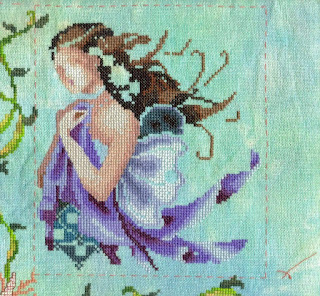 Karen stitched the shells and seaweed first then specified which parts of the mermaids to stitch so they are not confined to boxes but float on the sea of her fabric. And here is the full piece, only one block to go. This is a Large Mirabilia RR, each block is 5,000 stitches rather than the usual 2,500 so we have been given longer to stitch each round and there are three groups of four stitchers. Imagine if all of us were stitching on one piece each with 12 blocks!! It would be massive and take about 3 years to come back to you! Not sure what format this will take. I have some end-of-term present stitching to do, that's a holiday and a celebration. Also a couple of birthday cards/presents to stitch. And a wedding sampler. I think that takes care of the theme for now. Finally, it's July tomorrow so I'll be starting the Summer Blog Hop very soon. One lucky participant will be receiving the first emailed postcard to show on their blog. There's still plenty of time to join in, just click on the link to the top right to find out how. This month's Alphabet Kitty is a patriotic Union Jack kitty stitched on pale blue evenweave which will be backed with some Union Jack Ribbon and a nice Union Jack button as the charm. Now the Thread Pickerz Heartz SAL is over I get my Sundays back for ornie finishing. For some reason Sunday feels like a finishing day. 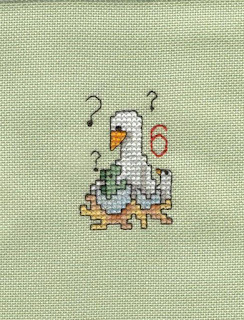 This is stitched on the same green evenweave as the rest of the series, I used some DMC Light Effects thread for the eggshells. The first heart was charted as a solid heart to show off the variegated threads people were using. I changed it to show our initials, mine, hubby's and the boys'. Finally, the photos are coming in for my Summer Blog Hop. All I need is a photo of something you've stitched on a Home theme. Click on the "There's No Place Like Home" picture to the right of the blog for more details. Once we get into July I will start sending the photos out to the participants. The Blog Hop will run all Summer so don't worry if you've not signed up yet, there's plenty of time. WIPocalypse is hosted by Measi of Measi's Musings. The main focus of my WIPocalypse this year will be my "13 in '13" a list of 13 projects I want to complete in 2013, click on top tab for the list. The chart was a prize from Riona of Oubliette, the fabric is Summer Sky by Crafty Kitten and the hand-dyed thread is from Jodyri Designs, a new company I found through FB. They have a monthly thread subscription. You can pay for either 5 or 10 skeins a months and after 120 skeins you will own the whole collection. Unless she keeps dyeing more colours in which case it's a lifetime subscription! I would have finished it but I ordered some little mother-of-pearl fishes from an Ebay shop and they took a week to get here. I am too used to SewandSo's next day delivery! My cousin is getting married in August and she posted a photo on FB recently of a chocolate Gruffalo and said how much she loved him. The toys are sold in our bookshop so I bought them and made up the little outfits on Saturday after I discovered the girls would be popping in today to see us. The bride's outfit is made from curtain fabric samples and the groom's is some nice black felt. For those of you unfamiliar with the Gruffalo, he is a character from a children's book by Julia Donaldson and extremely popular with young children (and soon-to-be wed women too). Here is the Gruffalo website. For those of you who are familiar with the Gruffalo please ignore the fact that the Bride is actually The Gruffalo's Child. There is no mention of a Mrs Gruffalo in the books, maybe she was eaten by the Big Bad Mouse? No-one knows but Mr. Gruffalo does his best as a Lone Parent to bring up his little girl with a healthy respect for the danger of the Deep Dark Woods, which of course she ignores as in all the best stories. Finally, don't forget the Summer Blog Hop on the theme of "There's No Place Like Home". Just click on the picture on the top right of the blog for more details of how to join in. If I said I'd stitched a Mummy Kitty what would you think of? would it be anything like this? This is for the Hallowe'en Ornie SAL blog June choice, mummies or tombs. I couldnt find a design that really appealed to me so I adapted one of the kitties from Carand88 into Mummified Kitty. I stitched him on 28 count black evenweave using threads from my scraps bag so I'm sorry I don't have DMC numbers for them. 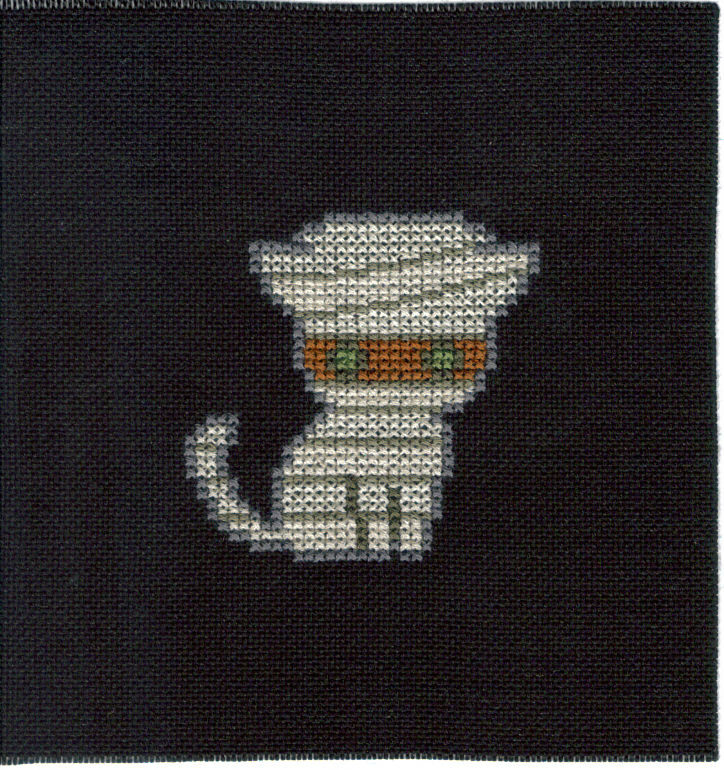 I stitched the outline exactly as charted for Frankenkitty then stitched the grey lines in an elongated stitch one thread high, two threads wide then just filled in with two shades of cream. I used two because I didn't have enough of either to stitch the whole kitty! I can't decide what the pale piece in the centre is, it looks like a wing but she's a mermaid! Looking at this picture it seems more like a big bow. You can see how much bling there is going to be by the amount of blank areas. I've made a good start to this theme, first up is the JBW Alphabet kitty. June's kitty is a patriotic red, white and blue kitty to celebrate the Queen's Official Birthday and also the 60th Anniversary of the Coronation. The Queen's Diamond Jubilee was last year as she ascended to the throne in 1952 but it took a year to plan her coronation. Kitty is stitched on some pale blue 28 count evenweave. 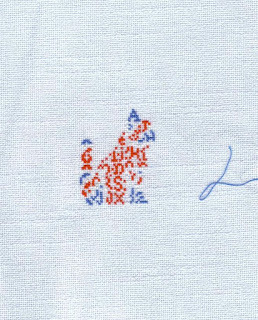 I drew an Union Jack pattern on graph paper using pencil then carefully inked in the letters in red, blue and yellow (so it would show up). Then just stitched as usual. The white isn't very clear and the alphabettiness isn't as obvious on this kitty but as part of the set it will look good. I've just realised I haven't put June underneath him yet. I have some Union Jack ribbon to back him with. The second animal themed piece is the Dragon Dreams 12 Dragonlets of Christmas. 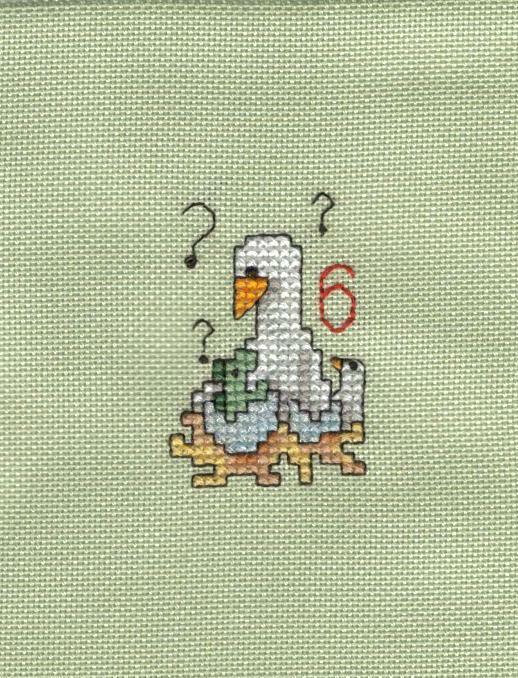 Alongside our dragon we have a very puzzled Goose for Six Geese a'Laying. Who is this little cuckoo in the goose's nest? I used a DMC light effects thread for the egg to give it a nice eggshell sheen. The Dragonlets are only available through Dragon Dreams' page on Facebook. My third piece is only just started, the Hallowe'en SAL ornie so photos will have to wait. Finally, the photos are coming in for my Summer Blog Hop. All I need is a photo of something you've stitched on a Home theme. Click on the "There's No Place Like Home" picture to the right of the blog for more details. You left a nice comment here earlier but you are a "no reply" blogger so I can't contact you that way either. If you'd like some help, please drop me an email and I'll do my best! It's TUSAL time again! For those of you new to blogging, the TUSAL is a project run by Daffycat, click on the button on the right hand bar for more details. This month is an outdoor TUSAL, Joan Elliott's Wizard posing with Brooke's Books June cake. The plan is to stitch all 12 of those monthly cake designs. I’ve managed two! This week I have been focused on the Mirabilia Shimmering Mermaid for the Round Robin in the evenings. For myself I have been stitching the monthly Alphabet Kitty, the Dragon Dreams design and Joan's June Wizard. Pictures saved for another day! Finally I have launched the sign-ups for my Summer Blog Hop. This year the theme is "There's No Place Like". All I need from you is a stitched picture on the Home theme. Click on the nice bright green Home design on the top right of the blog for full details. To celebrate my 400th Follower I showed a picture of my Millennium Sampler personalised with people I felt needed to be remembered for their contribution to life in the previous Millennium. I decided to ask everyone who they would have included on their own version. I was bowled over from the choices! No-one had the top answer - me, but I guess my contribution to global happiness (ie this blog) only started in the 21st Century so was not eligible hahaha. As promised, here is the full list of nominees plus links for those of you who'd like to learn more about them. There are certainly a few I had not heard of. The English education system is quite neglectful of famous American civil rights activists. Frankly we're not taught much beyond "You broke away from us and went downhill from there". Queen Elizabeth II - our current Queen, has reigned for over 60 years. Sir Keith Park - New Zealand soldier, First World War flying ace and Second World War Royal Air Force commander. Leo Tolstoy - Russian writer who primarily wrote novels and short stories. Mark Rothko - American painter of Latvian Jewish descent. Neil Armstrong - American astronaut and the first person to walk on the Moon. Tim Berners-Lee - British computer scientist, best known as the inventor of the World Wide Web. Phew!! I don't know about you but I'm exhausted and I did that list in two shifts! So Finally, the part you've been waiting for; the winner of the 400 Followers Giveaway. Drum Roll. Sir Frederick Grant Banting, KBE, MC, FRS, FRSC was a Canadian medical scientist, doctor, painter and Nobel laureate noted as the primary discoverer of insulin. In 1923 Banting and John James Rickard Macleod received the Nobel Prize in Medicine. Unfortunately Sir Frederick could not be with us this evening so I'd like to ask Shebafudge to step forward and receive the prize on his behalf. Sharon had a personal reason for choosing Sir Frederick, without his discovery of insulin her daughter would not be with us today. Congratulations to Sharon, a little something will be in the mail to you some time this year! Finally, finally, a huge Thank You to everyone who left a comment and nominated a person/persons for inclusion on our sampler. I had a great time finding out all about the different people and I hope you did too. Next week, there will be a short exam on what you have learned this week. Home is where the Heart is, Home Sweet Home etc. There are so many Home-themed mottoes and they are the theme for this year's Summer Blog Hop. Hurray! Last year I asked for holiday postcard stitched pictures to be sent via me to various bloggers. See the full list and links here. This year we're having a "staycation" and I would like you to send me a photo of something you've stitched on the Home theme. It can be a piece you already have in your collection or one you stitch especially for the blog hop. It could be a traditional sampler, it could be a country cottage you'd love to live in, it might be a Michael Powell house that he is so well-known for. Or maybe a view of your home town or something from your homeland, especially if they have a style of stitching associated with them. Once you've chosen your piece just email it to me (my email is in my profile) along with a little message on the home-theme, maybe why you love your home or (if you're Shirlee) why you'd love to live anywhere other than the Devil's Playground. Over the Summer I will send the pictures and messages to the other participants to display on their blog. So keep your eyes open for your piece over the next three months. 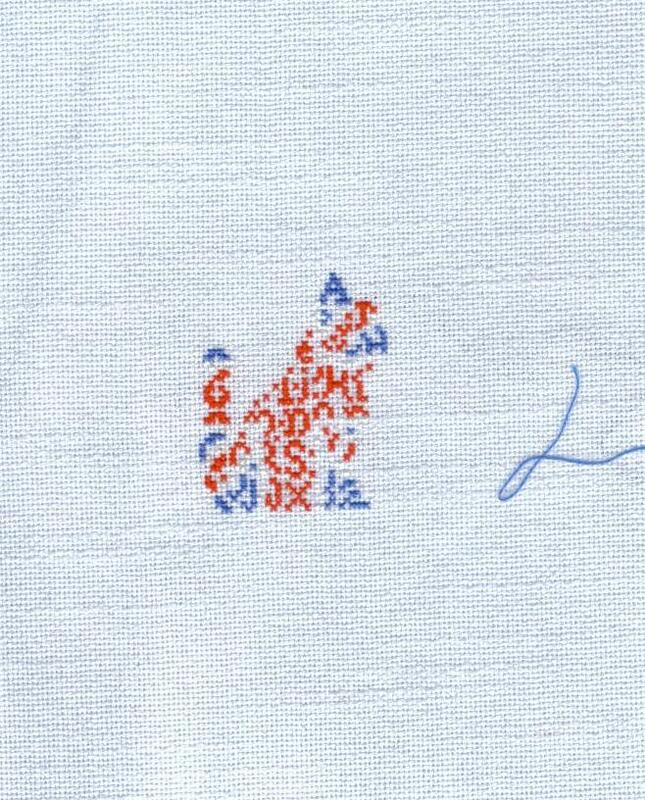 You've got until the end of August to email me but please start sending them sooner if you have something already stitched. Once I have a few I will start the Hop!! Leave a comment if you think you'd like to join in so I can get a rough idea of numbers. Finally I have decided to use Feedly for my blog following. Anne recommended it as being very similar to Google Reader so I gave it a try. The computer version is different to the iPad app version but both are very easy to use. They work in tandem with Reader (while it exists) so if I read a blog in one it is marked as read in the other. Useful for the changeover. I just couldn't cope with the missing G from Bloglovin, not without an apostrophe at least! I kept reading it as Blog Glove In.